With this backdrop the Government is set to forge ahead with its ambitions to rectify and grow the housing market which was heavily hit during the recent period of recession. Private investment into major residential developments schemes has been resurrected since the recession and previously mothballed major schemes are now progressing through the planning and construction phases in London and the South east. 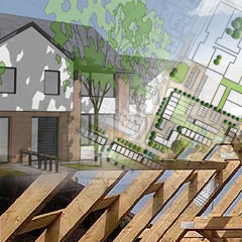 We provide specialist services for all phases of small and larger residential developments including early site layout advice, impact assessments, formal input to EIAs, discharge of planning conditions, internal design and pre-completion testing.